Energizer® brand products have been a staple in our home for powering all of our battery operated products over the years. I have consistently found that Energizer® batteries are the longest lasting batteries compared to other brands that we have used in the past. Recently, Consumer Reports tested 15 of the most popular AA battery brands and the winning battery for use with high tech devices is the Energizer® Ultimate Lithium AA battery! Perfect for use in digital cameras, LED flashlights, emergency radios, two-way radios, handheld GPS units and much more, Energizer® Ultimate Lithium AA batteries are considered to be the “world’s longest lasting” battery. My family uses the Energizer® Ultimate Lithium batteries in our LeapFrog products as well as other portable gaming devices. It is particularly useful for my digital camera which normally drains batteries extremely quickly. It has been very frustrating to run out of battery power to my digital camera in the past when using it during a special occasions and I can’t tell you how many photo memory opportunities that I have missed out on because of a dead other-brand battery. The Energizer® Ultimate Lithium battery can last up to 9x longer than even the Energizer MAX® in high drain digital cameras making this my go-to battery for all of our high tech products. I also know that when using these Energizer® batteries in our emergency alert radio, I can feel confident that the long lasting battery power will keep going during the strong spring storms and throughout the Florida hurricane season. My husband and I were very impressed to learn that these batteries can hold their power for up to 20 years when not in use so we have decided to keep several packages of Energizer® Ultimate Lithium batteries in our emergency preparedness kit too. The batteries are noted to perform well in extreme temperature conditions from -40 degrees F to 140 degrees F too! 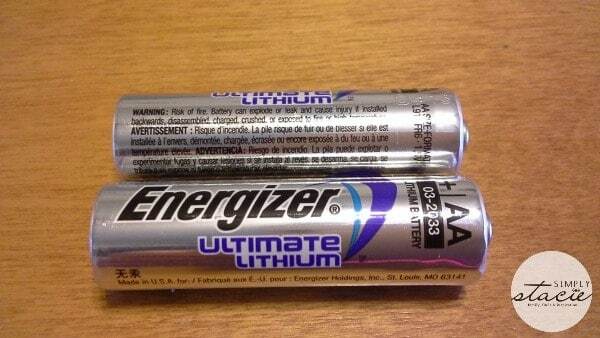 If you are tired of spending money on inferior batteries that cost a lot of money and yet do not perform well in the long run then I highly recommend using the Energizer® Ultimate Lithium AA Batteries which are available for purchase at major retailers throughout North America. I have been extremely pleased with the high quality performance and attractive pricing of all of the Energizer® products that we use in our home. You are invited to visit the Energizer® website to learn more about all of the batteries and products available.